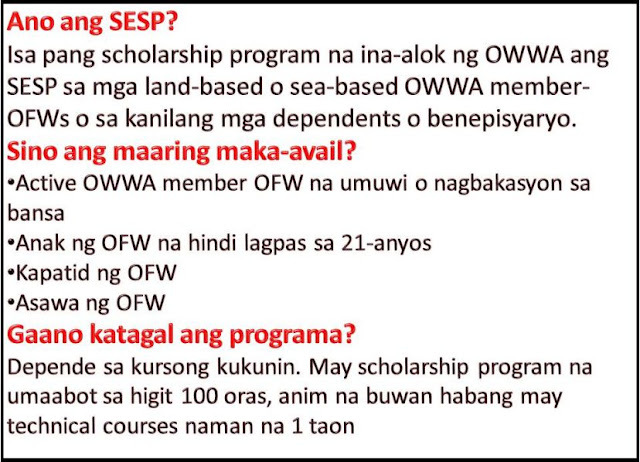 THOUGHTSKOTO Thoughtskoto : How to Apply for OWWA Tech-Voc Scholarship for OFWs and Dependents? 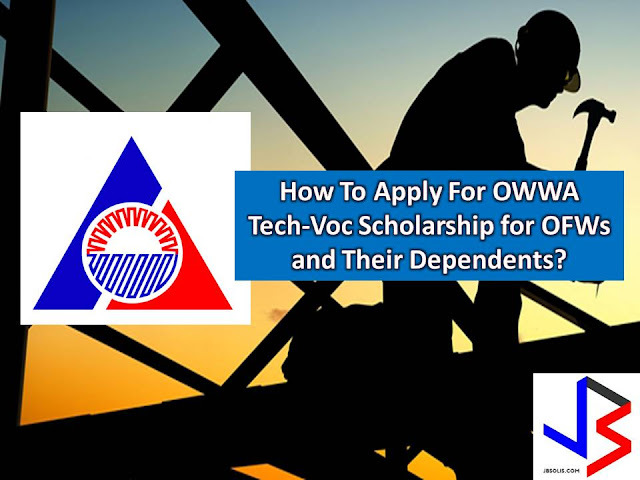 How to Apply for OWWA Tech-Voc Scholarship for OFWs and Dependents? Here is a good news to Overseas Filipino Workers (OFW)s and their dependents who wish to pursue the technical vocational course. You may now apply for training assistance program of Overseas Workers Welfare Administration (OWWA) Skills for Employment Scholarship Program (SESP). This program is open to all active OWWA members, or their dependents. OWWA will pay the expenses of taking up any tech-voc course accredited by the Technical Education and Skills Development Authority (TESDA) in any training course within their respective region. Under the SESP, the applicant is granted to the actual cost of training fee, with a maximum of P14,500. In the event the training fee for the applicant’s chosen course is above the said amount, the applicant shall bear the excess cost. The scholarship is open to OFWs who return to the country with valid OWWA membership. If the OFW is abroad, the scholarship is also extended to the OFW’s qualified dependents: spouse or child for married OFWs; or single sibling for single OFWs. OFW child should also be 21 years old or below by the time of application. SESP is offered to active OFWs and their legal dependents who wish to enroll in the 6-months or 1-year Technical Vocational courses in any TESDA-accredited training institution. Duly filled up application form from OWWA office or you can download it here. Once documentary requirements are met, you can now submit your application and requirement to the nearest OWWA office in your area. Most of the scholars took up tech-voc courses on Welding, Care giving, Safety Standards Training, Cookery and Computer-related courses. The following are TESDA Courses you may choose but it depends on what courses are being offered in your area. A TESDA certification or a National Certificate II (NC 1 or NC II) are common requirements for skill-oriented local and overseas jobs.